An apple a day keeps the doctor away, as they say. 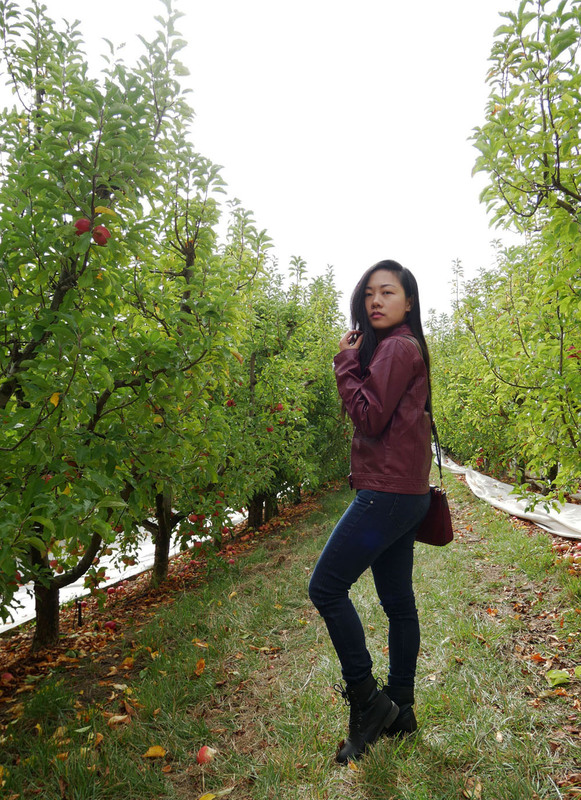 Even though I'm not the biggest fan of apples, off I went to go apple picking at my first time attending a "Pick a Pink Lady" weekend in South Australia. Pink Lady apples, obviously. I've been cherry picking at Harrisville orchards before, and this time, I was back for the apples. I couldn't resist asking the owner why the apple picking event was only for 2 days while cherry picking lasts longer. Apparently, if they opened up for public picking a week early, the apples would not be ripe enough, and if they opened a week later, the apples would be over ripe. 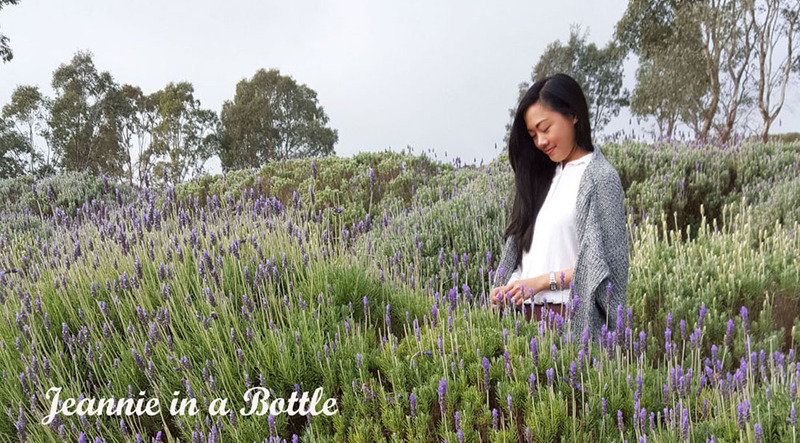 Thus, the perfect weekend to open also happens to be the weekend before Mother's day. The entrance fee was $5 per person, and the apples cost $5 per kilo. So off we went choosing the perfect apples. Picking them is simple - twist rather than pull. Because when you pull an apple down, other apples come down with it. Huh, that statement sounds metaphorical but meant to be quite literal. 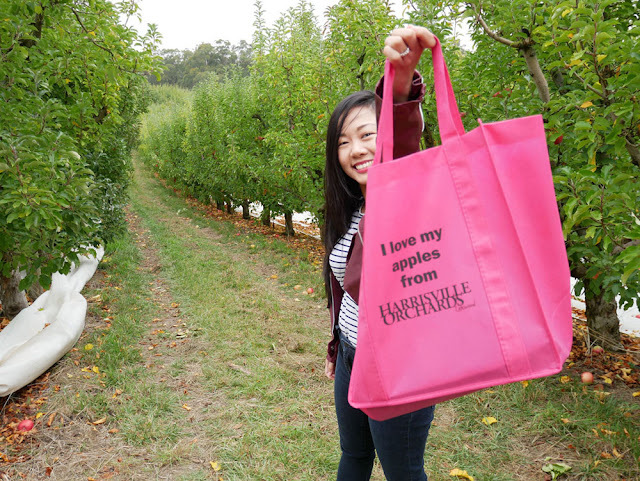 The entrance fee included this reusable pink bag for you to put your apples in. Now on to the outfit. For a lovely autumn day that I spent outdoors, I chose comfort and convenience - oh and laziness too. 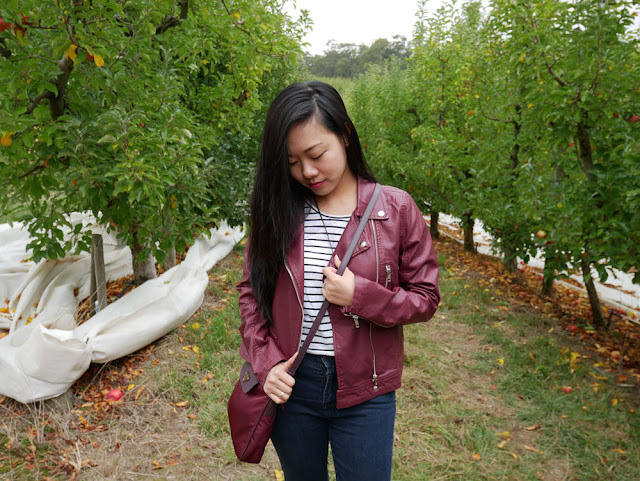 Combat boots, black jeans, a classic striped t-shirt, and then of course, this Elida moto jacket from Tobi in the most beautiful wine color. This faux leather jacket would be the automatic star of any outfit because of its gorgeous color and design. 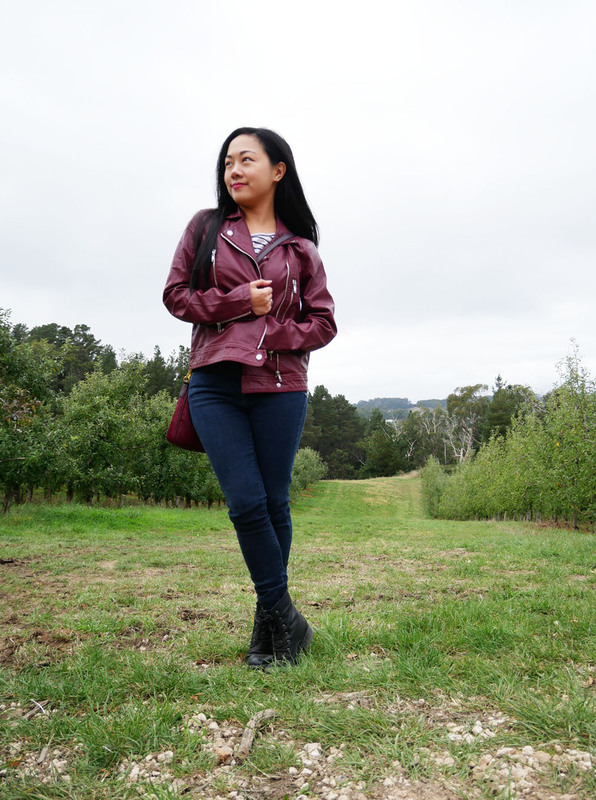 Needless to say, this faux leather wine moto jacket made me an automatic fan of Tobi.com/au. What do you think of this look? Also, have you been apple picking before? Your jacket is awesome! I do love apple picking. I haven't had a pink lady in forever but now I kind of want one. Love the photos! I also love your jacket! I haven't tried apple picking yet, but I definitely will! :) Cute outfit! 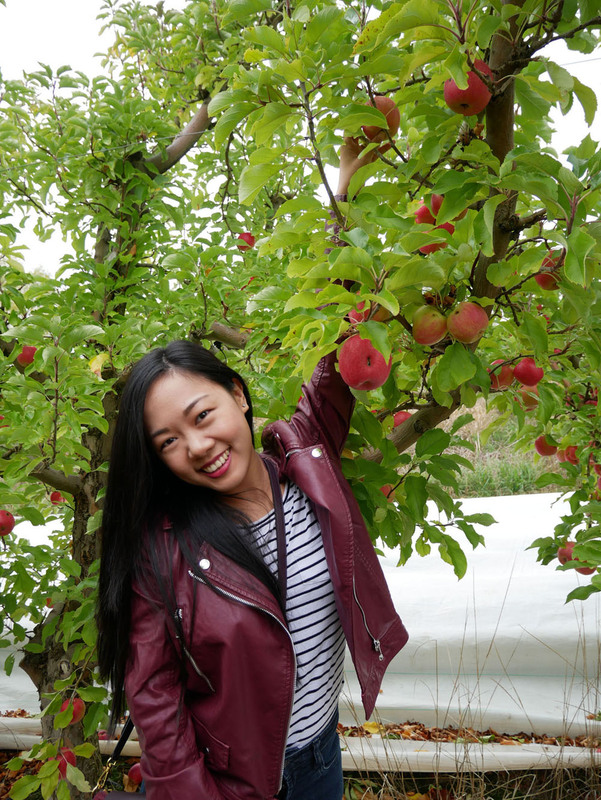 I've never been apple picking before but it seems like so much fun! I love your jacket btw! so cute, I love pink ladies! I didn't even know you can apple pick this time of the year! I thought it was only available in the Fall! I've only been strawberry picking, but apple picking sounds fun! I love pink lady apples...they are my favorite! :) Also I'm loving your jacket...the color is gorgeous! Such a cute jacket. I love apple picking although I haven't done it it years. Looks like a great day!! <3 Apple picking is so much fun!! <3 Love your jacket! I have a similar one! Haha! :P Have a wonderful week ahead! I've never picked apples, but it seems like such a sweet, picturesque thing to do. These photos definitely back that idea up. They're lovely! I absolutely love apple picking! It is my favourite thing to do when fall rolls around. You're so lucky you got to go in the summer too. 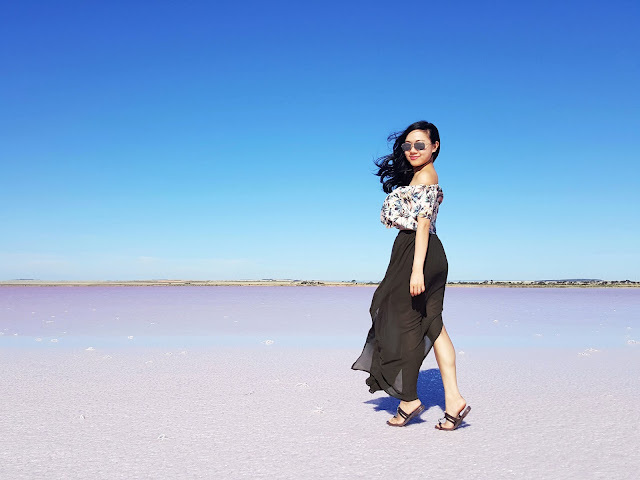 You look so cute and this was such a great idea for a post and photoshoot!! THIS SOUhttp://lippie143.blogspot.co.uk/NDS LIKE FUN, SO NEED TO TRY IT. ENJOYED READING THE POST. I know apple picking is so much fun, and I can not believe how much better they taste when they ar fresh and picked off the trees then when you get them in the store. such a cute look dear. Looks like you had a great time picking up apples. wow u look so cool! Too fun! And loving your cute jacket, lady! How fun! Love your look too! How fun! I have never been apple picking! Apple picking is always fun! Love your burgundy leather jacket! Sounds like a fun time! 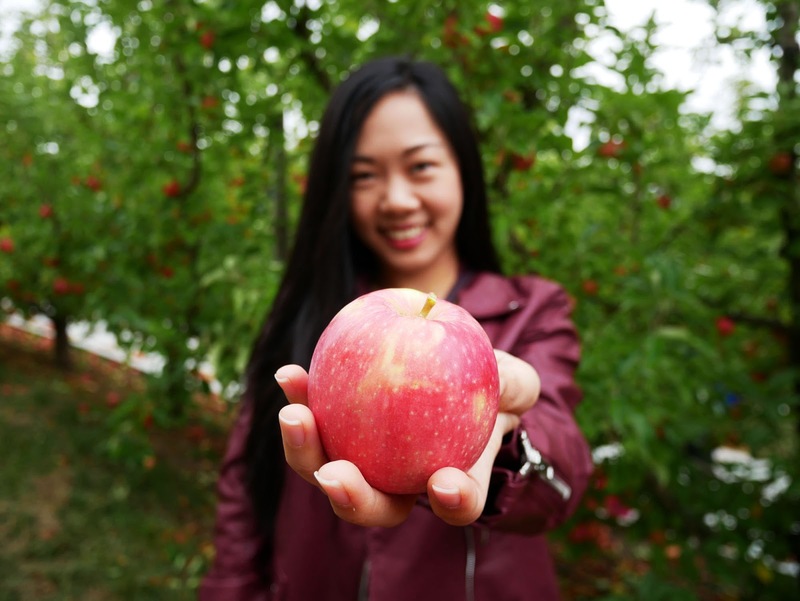 I love pink lady apples and have been to a few apple orchards and it really is so much fun! I love your jacket! I've never been apple picking but this looks so fun! I love these orchard pics! What will you make with all these apples? It looks like so much fun! You are so cute! This looks like a fun experience! I went to strawberry picking with the fam once! I live for apples! I love it because it's so readily available and easy to eat. You don't even need to take its skin off and it's healthier to eat it that way lol. I love your leather jacket aahhh! You look gorgeous! 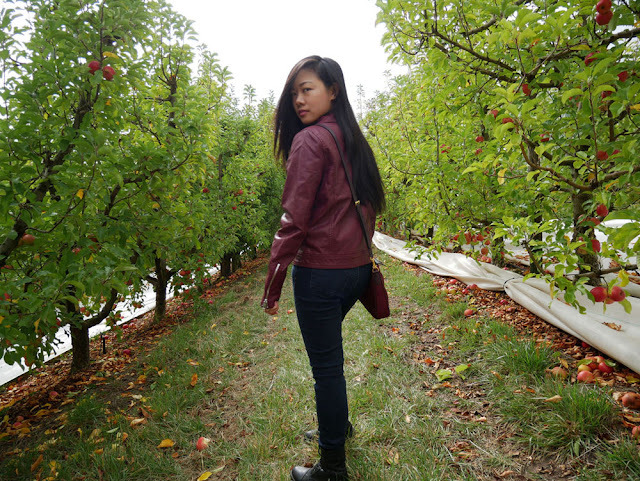 Apple picking is fun even if I'm not an apple eater too :) And that moto jacket you have absolutely looks nice! Awe this looked like so much fun!! Loved your photos! aww what a fun experience! twist instead of pull, i should remember that if I should ever go apple-picking :p love your jacket! What a nice outing. Love your casual outfit. Jacket says it all..I am sure you enjoyed picking apples. Have a great week girl! Just stopping by again to say I hope you're well!